I made this gem from the November ’13 issue of Food & Wine way back in January on a cold night. I didn’t realize I’d never posted this one! It was phenomenal. 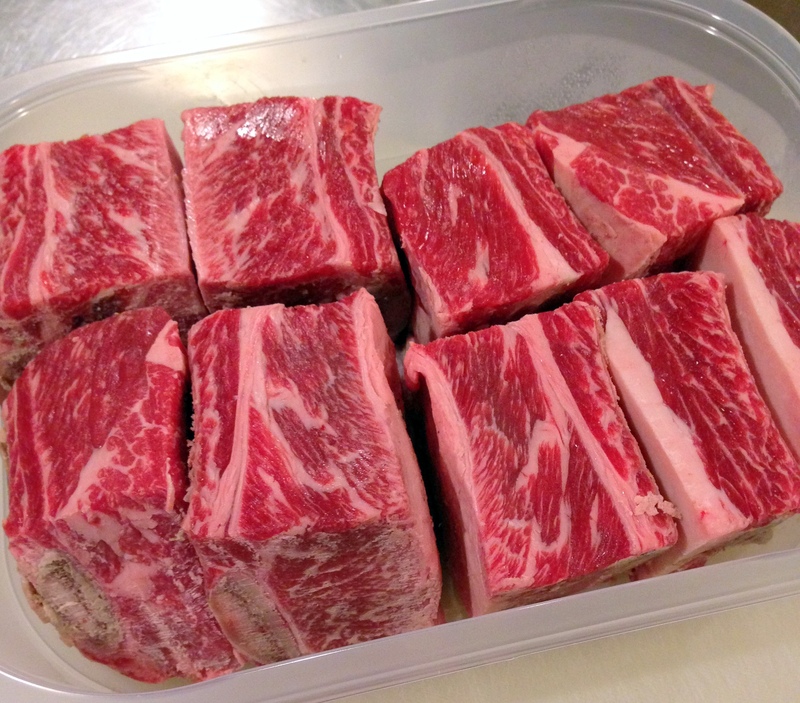 I have been a little obsessed with short ribs lately. 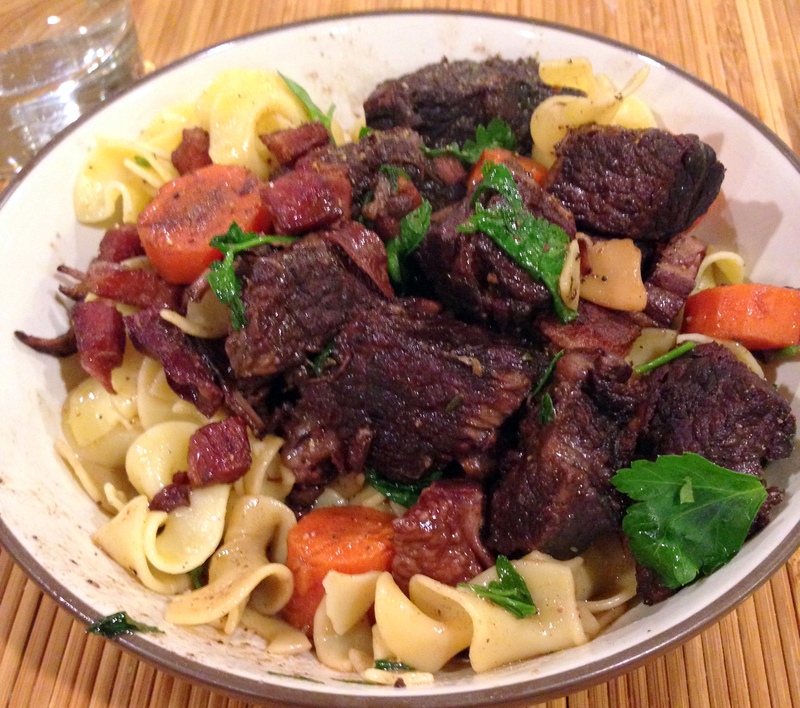 I’ve been making this soup somewhat regularly, and I have two other great short rib recipes to post soon. 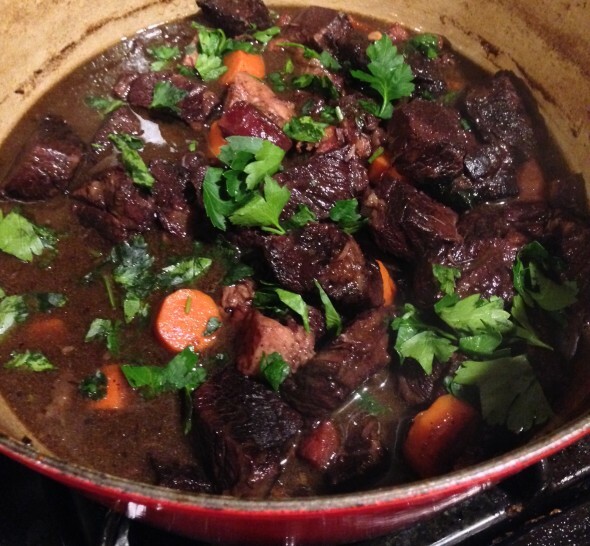 Of course I’ve made Bourguignon before, but never with short ribs, and I may never make it any other way from this day forward until the end of days. It was that good. But the original recipe does have mushrooms, which are a no-go in this house, so I just skipped that step. 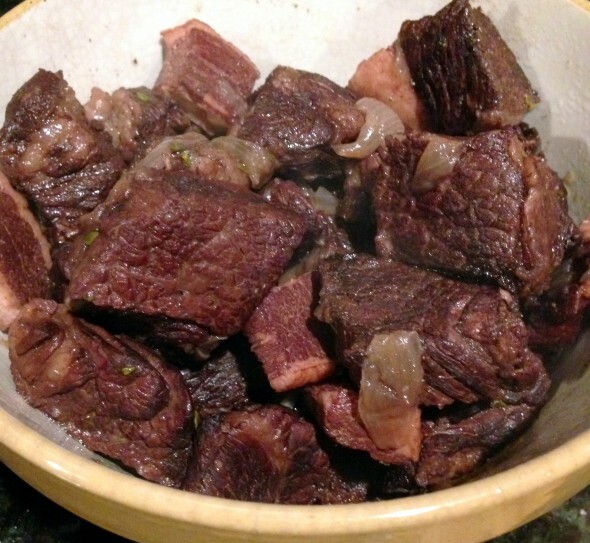 Side note: when I searched here for all of my short rib recipe attempts, I came across this one from 2008 that I’d completely forgotten about. I was such a rookie with “fancy cooking.” It’s kind of adorable how bad the photos are. Good notes on that cookbook, though. 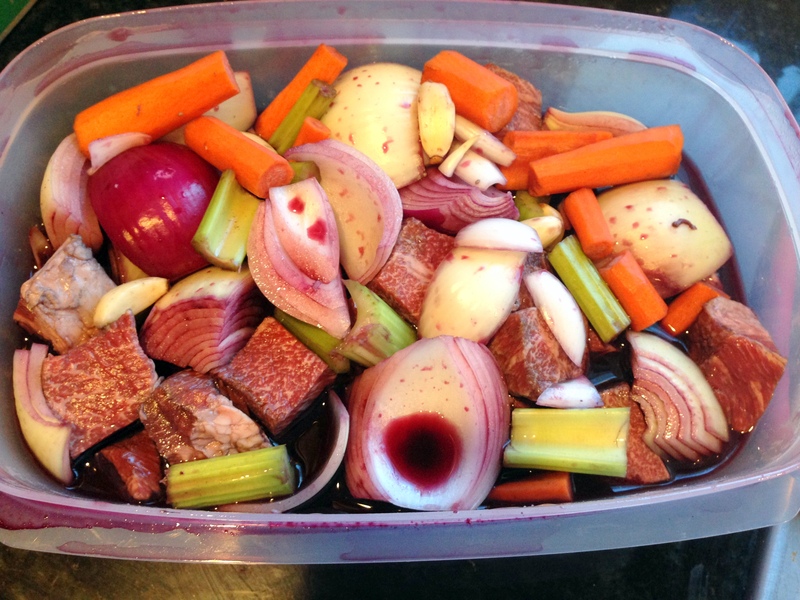 In a 2-gallon resealable plastic bag (I used a big tupperware), add the beef, 2-inch carrot pieces, celery, onions, garlic and red wine and refrigerate overnight. Preheat the oven to 300°. 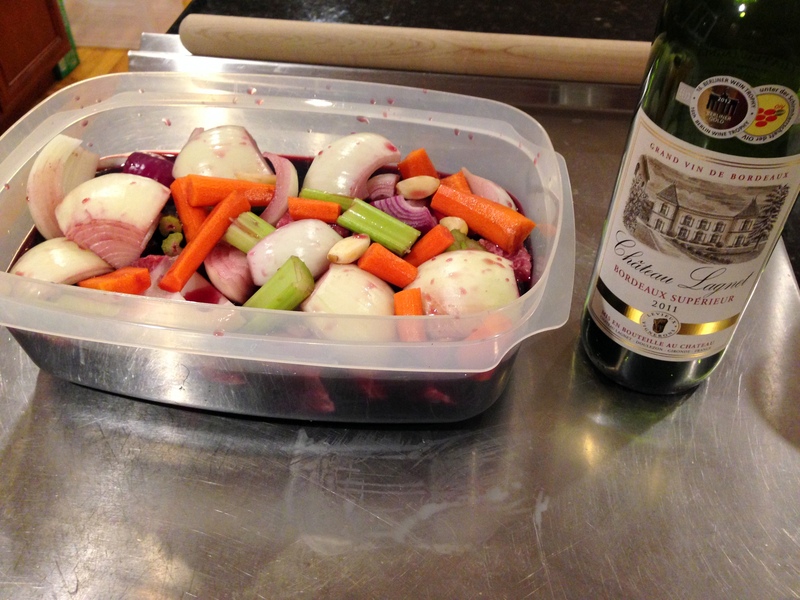 Strain the beef and vegetables over a bowl; reserve the wine. Separate the meat from the vegetables. Pat the meat dry and season with salt and pepper. In a large enameled cast-iron casserole, heat the olive oil. 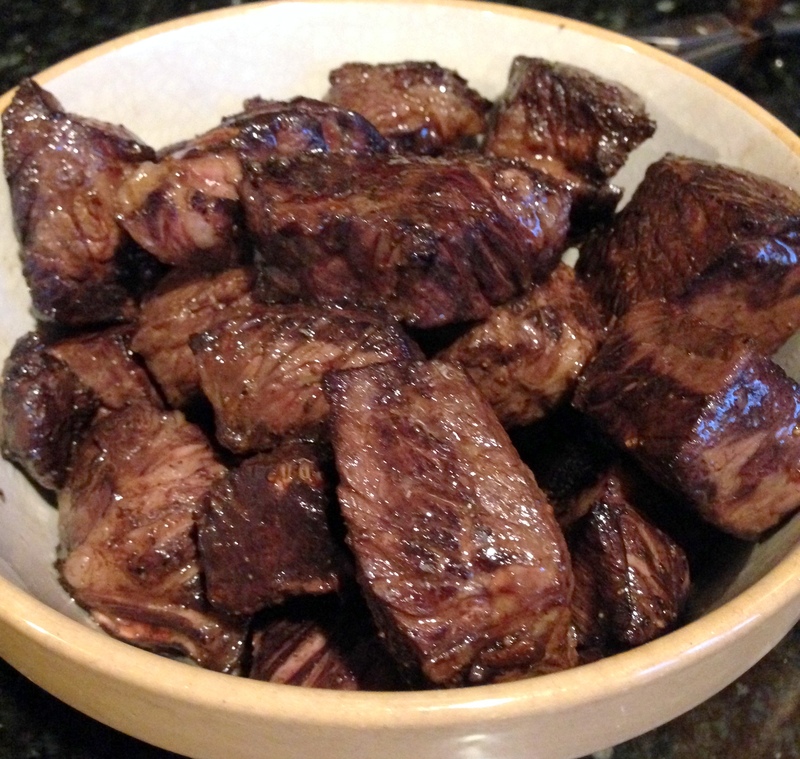 In batches, sear the meat over high heat until browned on all sides, 30 minutes; transfer the meat to a bowl as you go. 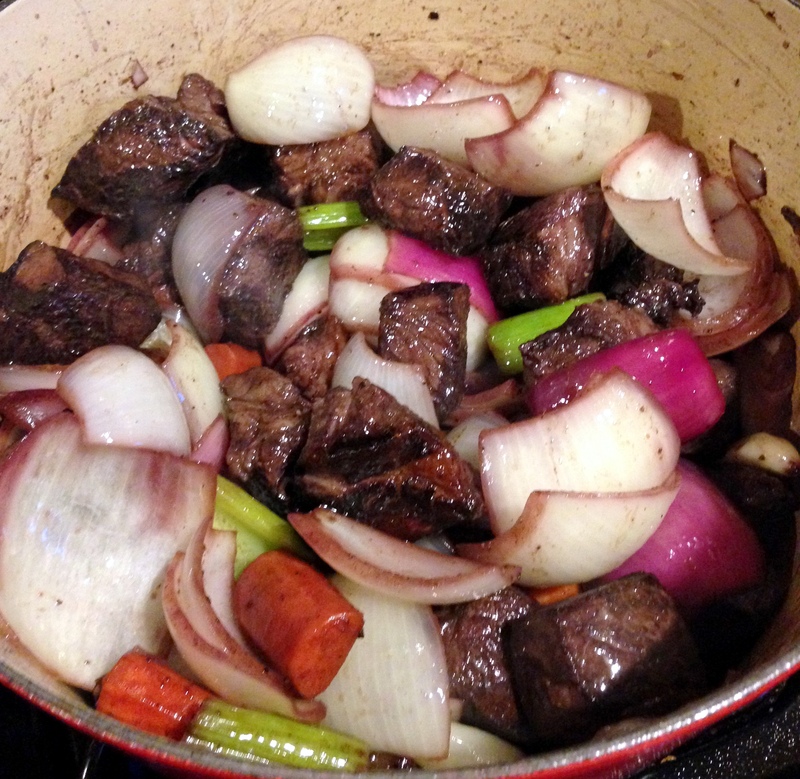 Reduce the heat to moderate, add the marinated vegetables and cook until softened, 8 minutes. 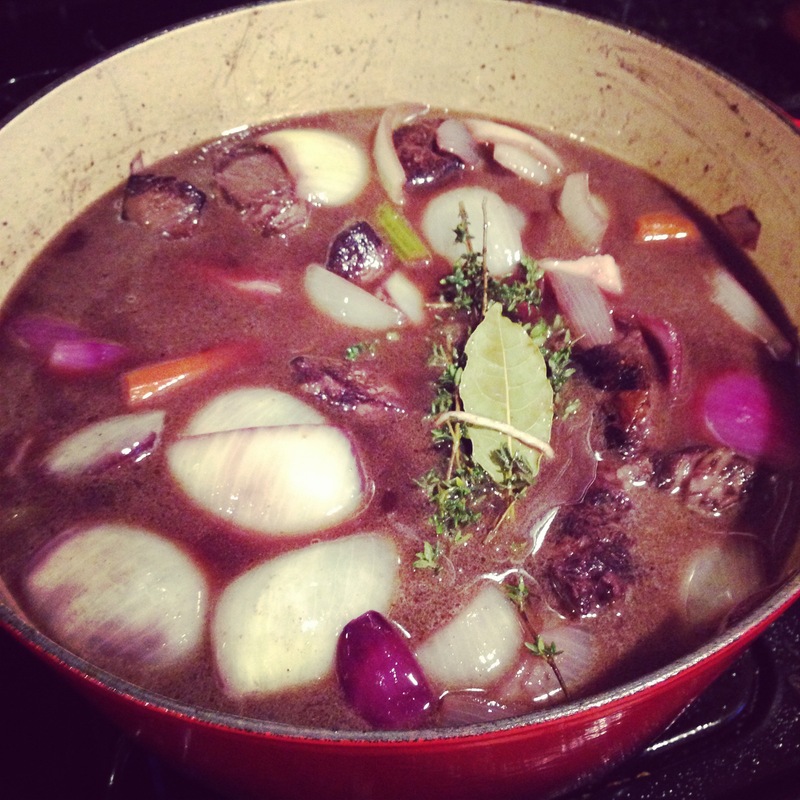 Add the reserved wine, stock, large bacon pieces, herb bundle and meat along with any juices; bring to a simmer. 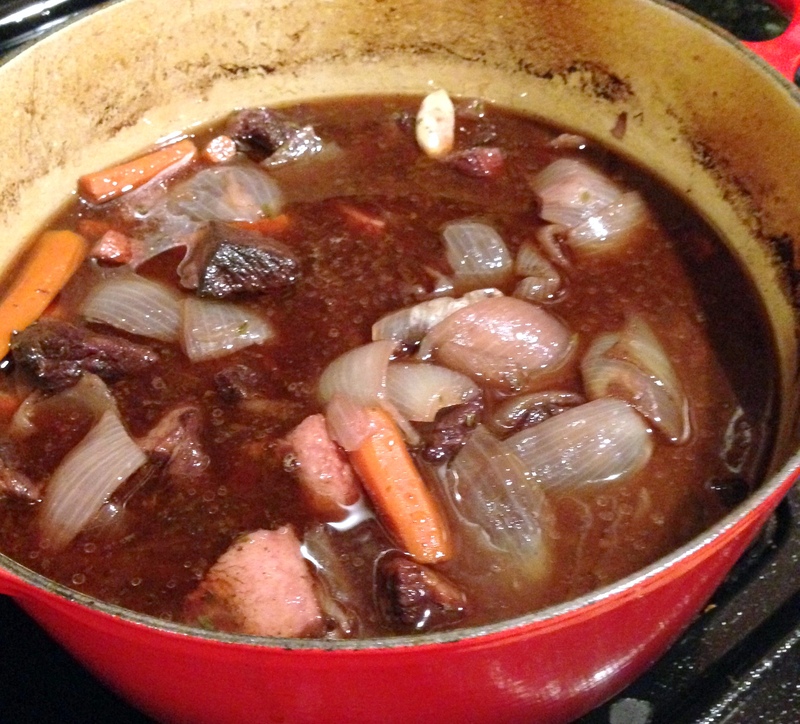 Braise the stew in the oven for 3 1/2 hours, until the meat is tender. 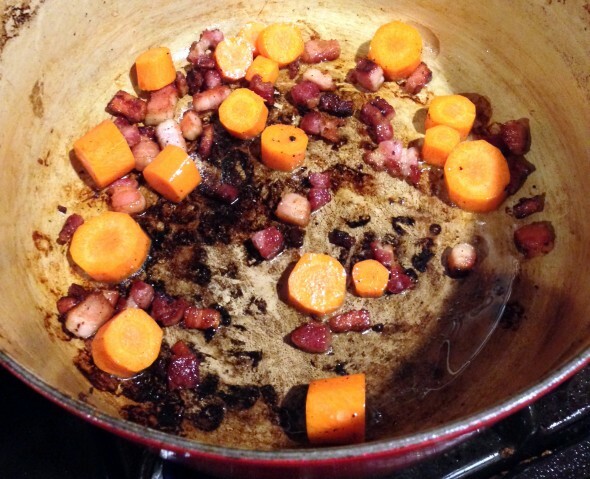 Using a slotted spoon, transfer the meat and bacon to a bowl. Strain the liquid, discarding the solids. Wipe out the casserole. Add the lardons and crisp over moderately high heat, 10 minutes; transfer to paper towels. Working in batches, add the mushrooms to the casserole and cook until golden, 8 minutes per batch. Add the mushrooms to the meat. We totally skipped this step! No mushrooms here. Okay, here I admit I just didn’t read closely and essentially replaced the mushrooms with the carrot rounds. 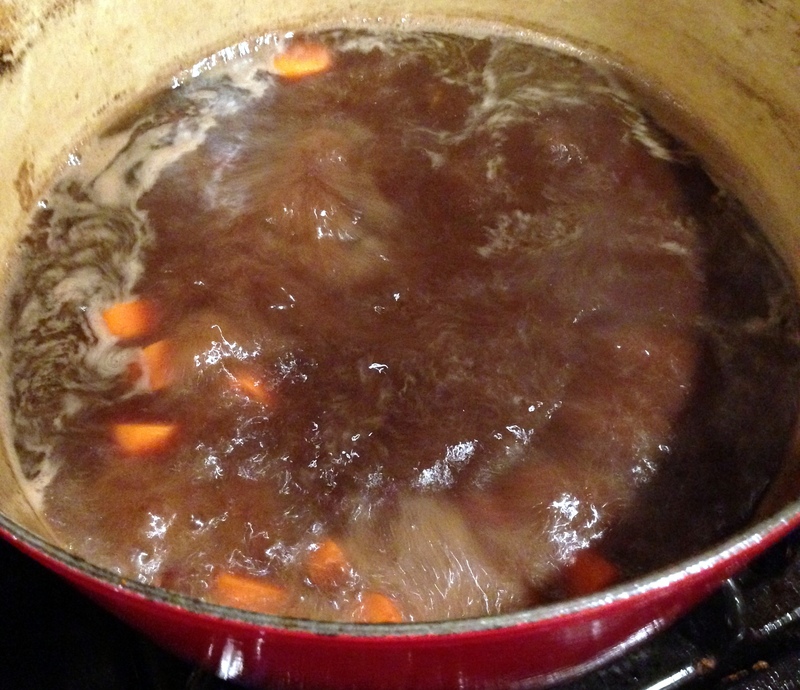 But this is what I was supposed to do: Add the carrot rounds and braising liquid to the pot and simmer until the liquid is reduced by one-third. Add the meat, bacon, lardons and mushrooms; simmer until the sauce reduces slightly. Season with salt and pepper and let cool. Refrigerate overnight. Skim the fat from the stew and reheat. 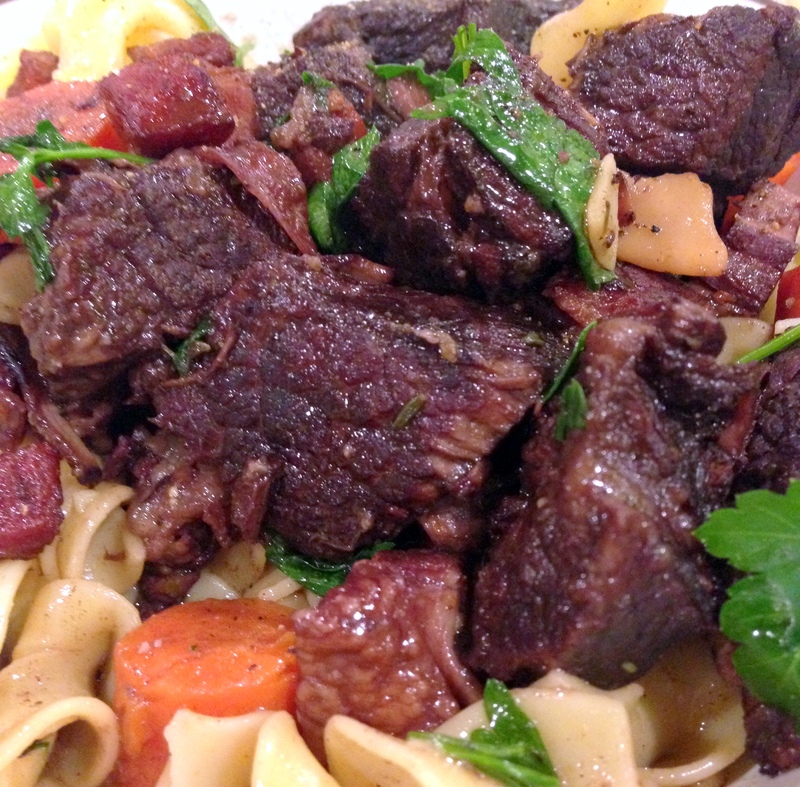 Garnish with parsley and serve.